Every year when the colder season begins clients come to me for clipping and I have gained plenty of experience. I am very relaxed with clipper phobic horses and horses being clipped for the first time. 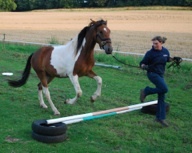 Using Intelligent Horsemanship techniques it is possible to help your horse overcome phobias, without the use of sedatives or twitches and other such methods, making life easier for both the horse and owner. 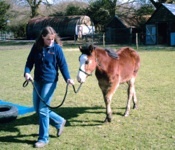 Preparing your horse correctly for handling, loading, clipping, foot management, long-reining and being ridden are all important for your horses education and I can help you to get it right the first time, avoiding unnecessary problems. To assess the reason for a horses behaviour we need to look at all the aspects of its management, including the environment where it is kept, the daily routine, feed, turnout and social interaction. It is important for you to inform me of anything that you feel may be relevant to the way your horse is behaving. 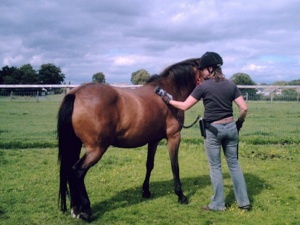 I will do an initial assessment of the horse to check for any obvious pain or discomfort. If any pain issue is found it will need to be addressed before treating the behaviour as a problem and I may advise that you call a professional to deal with it before we proceed. The Intelligent Horsemanship training process used is incremental and non violent. 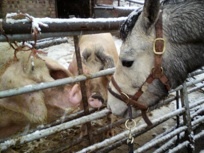 I work with your horses natural instinct and behaviour to help you and your horse make the best partnership. Intelligent Horsemanship techniques are based on passive leadership using pressure and release. 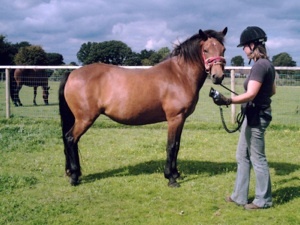 All horses are individuals and each session will be tailor made to the needs of your horse. Initially I will be working with your horse and at the appropriate time you will become involved so that you can carry on the training process after my visit. You will also receive a full written report on the training that we cover on the day to help you with the process. I am available via e-mail or telephone to support you. Subsequent visits may be arranged if required for any further support you and your horse may need. 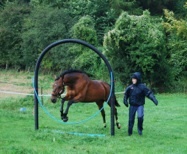 If it is necessary for your horse to have a more intensive training programme it can be arranged for your horse to come and stay with me, this is more cost effective than several visits. Please contact me for more details. Sheila also holds the Monty Roberts preliminary Certificate of Horsemanship.